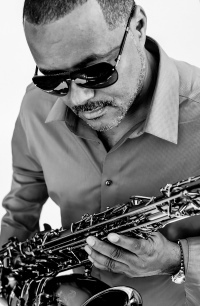 In 1986, New York City native Najee burst on to the R&B scene with a uniquely jazz-influenced set of contemporary, instrumental R&B grooves fronted by his distinctive, adept command of the soprano saxophone: Najee’s Theme. The gold-certified album garnered the multi-instrumentalist a Grammy nod and a worldwide following within the course of a year—climbing both the soul and jazz charts with hit singles such as “Feels So Good to Me,” “Betcha Don’t Know,” “Mysterious,” and a now-classic rendition of Anita Baker’s “Sweet Love.” 30 years and 15 albums on, the smooth purveyor of sophisticated soul ’n’ jazz is still going strong with the release of You, Me and Forever on Shanachie Records. SoulTracks’ Justin Kantor recently chatted with the man himself about the history and making of Najee’s Theme, as well as his latest CD. Check out the interview below. You studied music and did a lot of touring prior to releasing Najee’s Theme in 1986. Tell me about the years leading up to the album. Were you on the path to a record deal? I had a very sketchy time. I struggled between working with big acts such as Chaka Khan and starving. When Najee’s Theme came about, it was a result of doing a lot of session work in the New York area and just trying to figure out from gig to gig how to survive. Living in New York is very expensive. I had to hold on—and then the opportunity presented itself through Hush Productions, which had Freddie Jackson, Melba Moore, Kashif, and Meli’sa Morgan. It was an invitation to do a record. So, my first album was really a collection of demos. We had a $60,000 budget. Capitol/EMI put it out and we had a gold record in three months! How did you end up connecting with Hush? Through my brother Fareed, who was doing work with them through Lillo Thomas at the time. I was featuring on several things. Barry Eastmond, who wrote Freddie’s “You Are My Lady”—I played on that. I was known in the New York scene as a session and live musician who could play keyboards. Charles Huggins was at one of the sessions where I played sax (Meli’sa Morgan’s “Do You Still Love Me”) and said, “I didn’t know you played sax.” I told him, “I just do what I have to do to eat.” He wanted to sign a jazz artist. After he told me, he called me two weeks later to tell me he had a deal for me with Capitol Records! You play flute, also. Did you have a definite idea that sax was the way to go? How did that become the central instrument? My development as a jazz musician was really tenor sax, alto sax, and flute. But at the time, soprano sax was the dominant instrument in the genre I was doing. Kenny G, Ronnie Laws, Grover Washington, Jr… My brother and I got into an argument one day. He’s a guitarist and songwriter. He said, “You’ve gotta play soprano sax.” I said, “I’m not playing that little girl horn.” As things would go, when I did this record, I bought an $800 soprano sax. I didn’t play very well in tune. But I recorded a whole album that sold millions. You mentioned that the album was made up largely of demos. You worked with some notable people, like the late Wayne Braithwaite, Rahni Song, and producer Charles Elgart. What was the production like? How did you approach the songs, including the remakes? With the exception of Charlie, who was a guy I met doing somebody else’s recording, I just had a good sense we could do a collaboration that would work. The other producers were really more into R&B. My goal wasn’t to really record a jazz album, per se. It was really an R&B record using the sax as a voice. That was a great decision from a marketing standpoint. It was an R&B audience that established me. It converted over to jazz later. The world called it jazz then, but in my mind it was R&B. I noticed that the song, “Najee’s Theme,” was written by Rahni. Had you asked him to write something specific for you, or did he come up with it on his own? He was excellent at coming up with ideas. Whatever he came up with worked! It always felt good. One day I went in the studio; he had already laid down a basic track that sounded incredible to me. I put the melody on top. It just fell in place. There was really no plan. Beau Huggins, the A&R part of Hush, had an intuitive feel for things. He said we should call the album Najee’s Theme. I didn’t feel 100% about it; but in hindsight, he knew what he was doing. How did the remakes of “Sweet Love” and “Can’t Hide Love” enter the picture? “Can’t Hide Love” was something that Charlie and I had worked on. We decided to bring in drummer Omar Hakim, who had toured with David Bowie and was a neighborhood friend from Queens. We brought in Barry Johnson, who wrote a lot of songs for Kenny G. The arrangement seemed to work well. “Sweet Love” came about at the end of the project. Rahni wrote an arrangement of it, and it ended up being the first single. Did you have any reservations about being introduced with a cover song? At that point, whatever it was going to take to get us radio play! Najee’s Theme has a range from ballads to uptempo’s like “Mysterious” and “Feels So Good to Me.” It’s quite notable, looking back, that you had four charting R&B singles from the album, being that they were all instrumentals with only background vocals. Was that intentional to not feature lead vocals? Was there any pressure to feature more vocals? I pretty much did it the way I wanted to. As it was coming together, I directed some things. But for the most part, it was purely intentional on my part. I recognized at the time that there was a void in the marketplace. The jazz industry had pretty much slumped into nothing. I saw an opportunity, and I’m so happy it worked. 30 years later, we’re having a conversation about it! You had one track with a lead vocal, “We’re Still Family.” Who was the featured vocalist on that one? That was the late John White. Aside from chart positions—#1 jazz, close to the top 10 on the R&B Albums, you also got a Grammy nomination for the title track. Were you striving for that? Did it take you by surprise? You ended up touring as opening act for Freddie Jackson. Do you have any memories of that? Freddie and his crew were great. To this day, there are people from that tour that I’m lifelong friends with. Whether it was in the crew, or someone from his band coming to work with me. When I did my first headlining tour, Alex Bugnon was my keyboard player. Artie Reynolds played bass and Poogie Bell played drums. Even merchandisers. I was in Jacksonville last week, where I saw a guy who had sold T-shirts on the tour, and we still keep in touch!